HDMI Coaxial Cable Extender Set uses any one (1) Coaxial cable as the transmission media, is easy to install and works with any coaxial cable. The transmission distance depends upon the quality and bandwidth of the particular coaxial cable you will be using with SCP's 961. The 961 includes two units: transmitting (961-TX) and receiving (961-RX) units. The transmitting unit is used to capture the HDMI and HDCP input signals and carry the signals through only coaxial cable. The receiving unit is responsible for auto equalizing the transmitted HDMI multimedia data. The transmission range between the sending and receiving units can be up to 60m (180ft) under Full HD (1080p) with 7.1 channel audio. Extends the transmission range up to 60m (180ft) from the HDMI sources under Full HD resolution 1080p 24-bit color depth. 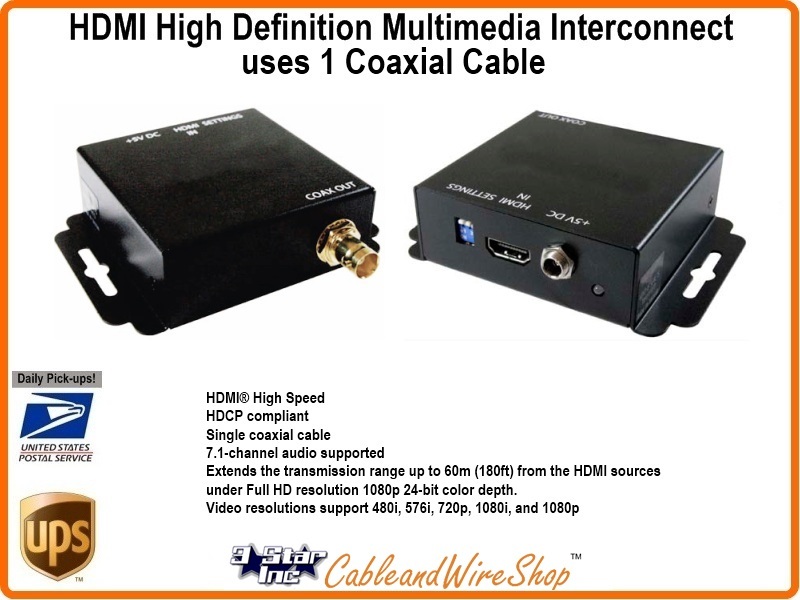 Note: A unique method to ustilize coaxial cables that may already be present, however, if you are planning on running New cable to extend your HDMI, we suggest you look at the Cat5e/Cat6 LAN cable extenders for HDMI extensions.